From turkey to tweets, preparing for the holidays and keeping their businesses on the cutting edge, women know how to plan for the future. It’s at this time of year that the male of the species can do nothing other than stand back and watch in awe as women execute a holiday season to remember without losing their stride in business. Certainly not an easy task, women across the country will be in need of some spa treatments or at least some lazy weekend mornings to make up for the break neck speed they manage to maintain from mid-November through the end of the year. How do they do it? Or the bigger question, why? If you polled a variety of women entrepreneurs, I suspect they would respond that they do it because so much of their passion is fed by spending quality time with those they love. It’s one of the main reasons women leave employee ranks and start their own enterprises. From Are Women Better Managers than Men? Women have great talents for simultaneously running home and business, but they can’t pull it off without a lot of pre-planning and resources. Even though Thanksgiving is upon us, it’s never too late to get your ducks in a row to manage your stress and energy through the end of the year. Here are 4 tips to help you keep your sparkle in the coming weeks. Plan ahead – It’s never too early to begin planning for the road ahead, especially when life gets doubly busy during the holidays. You will be managing your normal work load, while throwing in holiday parties, time with family, extra cooking, cleaning, shopping, etc. The first key to survival is to get as much done ahead of time, or delegated to spread the load, so you don’t find yourself scrambling at the last-minute. Choose wisely – It’s impossible to say yes to every invitation and activity during the holiday season, so only commit to the things that will bring you the most joy. Your happiness should not be allocated to the bottom of the list. When you have trouble deciding, put it to a family vote, and select the things that will be on your current list of must-do’s and those that will be allocated to next year. Be flexible – It’s time to put all those Yoga classes into play. The holiday season is wrought with the unexpected. No matter how hard you try to plan ahead, there will be surprises all along the way. Maintaining a flexible attitude is a step in the right direction. Secondly, remember tip number 2, and don’t feel obligated to accomplish everything that comes across your desk. There are certain things that can be dealt with after the New Year. Be a little selfish – Don’t worry, this tip will not put you on Santa’s naughty list. The only way to perform at 100% for clients, friends, family and co-workers is to make sure that you don’t sacrifice your health during the holidays. When it comes to eating right and getting enough rest, it should be business as usual. There are only so many hours in a day to get things done, so don’t find yourself burning the candle at both ends trying to exceed your personal limits. Forgoing exercise or a good night’s sleep for another commitment will catch up with you quickly when stress levels are high. By maintaining your healthy lifestyle choices, even during the hectic holiday season, you increase your chances of making it through without catching the flu. On that note, I am off to help my family prepare the “roast beast” for our Thanksgiving table. Thank you for taking time out of your day to join me here! 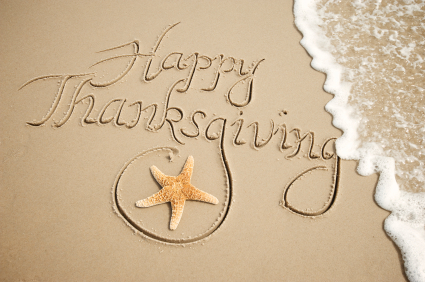 I wish you and yours a very Happy Thanksgiving! This entry was written by Dr. Shannon Reece, posted on November 25, 2010 at 8:00 am, filed under Alphabet of Entrepreneurs, Aspiring Entrepreneurs and tagged businesswoman, entrepreneur, planning, startups, strategies for women, Thanksgiving. Bookmark the permalink. Follow any comments here with the RSS feed for this post. Post a comment or leave a trackback: Trackback URL.